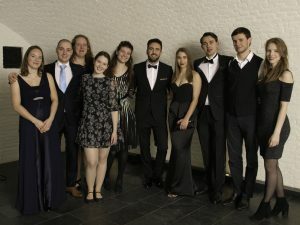 On Wednesday March 27, we exchanged our normal training hours for a very special evening: the NSSR Sportsnight 2019. In short: 10 sports, in black light, till 2 in the morning. We thought this was a perfect opportunity to deliver something cool. 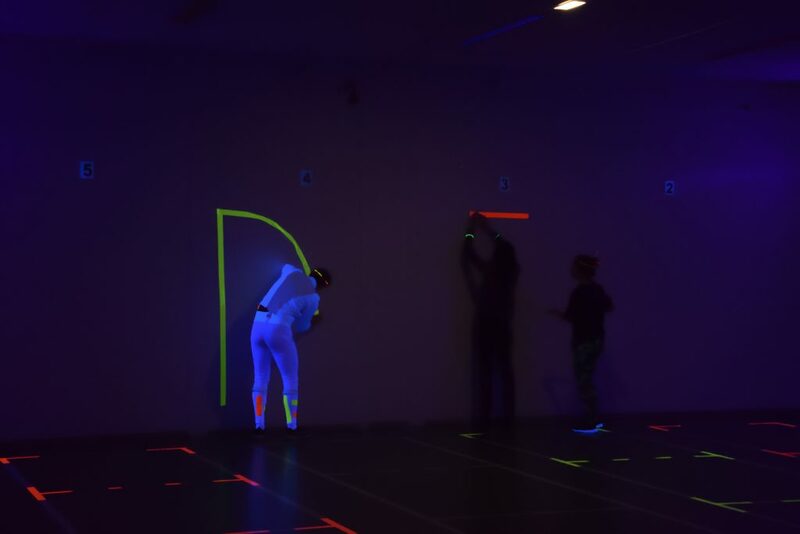 Hence, we used excessive amounts of glow sticks and glow in the dark-tape on the salle, weapons, masks and ourselves. It also involved some epic battle music. Preparing the salle with glow in the dark-tape on the floor, walls, doors and any other stickable stuff. And the result was quite nice! We gave a total of 6 workshops to multiple very enthusiastic teams. Battles were fought and all people were very eager to get some points. So, let’s do this again next year! And oh well, scraping all the tape off the weapons and walls was definitely worth it – even though it took us nearly an hour. Thanks to our members for helping out during the night! Below a selection of photos made during the evening (night). Photos made by Rieke Bande and Rein Wieringa (SFV De Cycloop). Many thanks! In case you’re on a picture and you would like it removed, simply use the contact form. Last Sunday, 11 of our members competed in the popular Delft Tegeltjestournament. One of our members entered in the women’s sabre, and 6 in the men’s sabre tournament, and in the epéé tournament 4 of our members competed. Besides that, in the afternoon we entered 2 teams in the recreational sabre equipe competition. This post was featured in the NSSR MegaMonday. This past weekend, the annual X-Systra tournament took place in Paris. Traditionally, this is one of the biggest student fencing competitions in Europe. Fencers from all levels are competing in this tournament, from beginners to people who compete in the worldcup circuit. 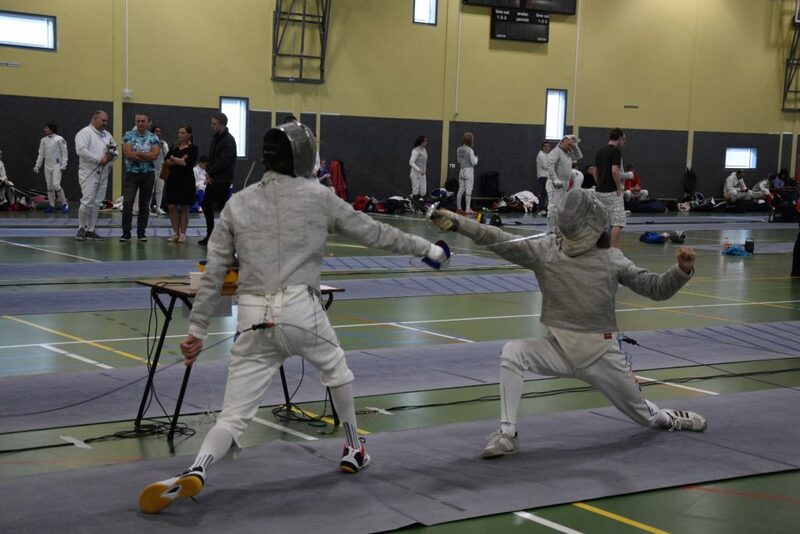 This time, two Don Quichote members competed: Thomas Nijsen (sabre) and Ashley Ophorst (foil). And with succes! The individual tournament took place on Friday. Thomas fenced a solid poule with 3 wins. He won his first eliminations with 15-10. He lost his next one with 15-10. He finished in 23th place (49 competitors). A great result! The team competition took place on Saturday. 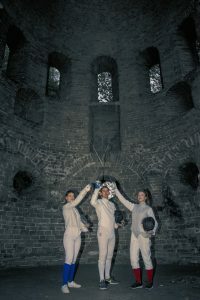 Thomas joined a team with two fencers from the University of Amsterdam and one fencer from Imperial College London. The guys made it to the semi-final, but unfortunately lost this match. They also lost the match for the bronze medal and ended in 4th place. Ashley was teamed up with one fencer from the University of Amsterdam, the University of Mainz and a fencer from the University of Tübingen. They also made it to the semi-finals, and only just lost this thrilling final by one point (45-44). Next, the ladies fenced for bronze and won it! We finished this amazing weekend with a nice gala and fireworks. We will surely go to Paris again next year! 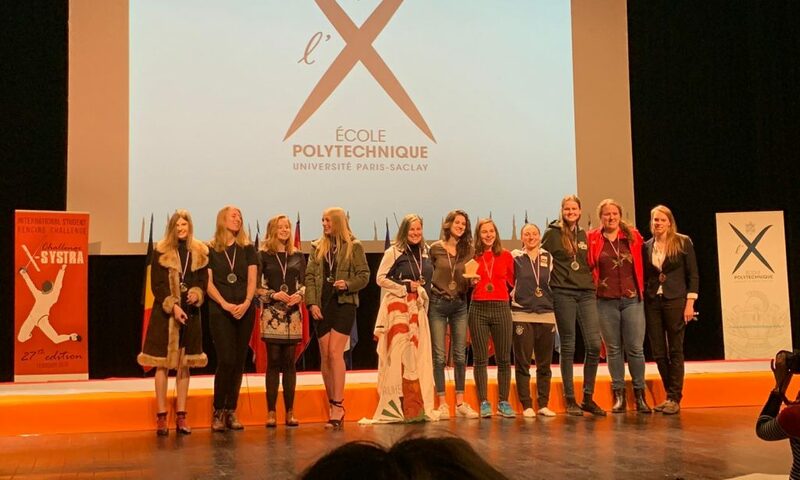 The women’s foil equipe medal winners, with Ashley and her team members on the right. In previous blogs I talked about Strip Coaching and Getting the Most Out of Your Practice. Both topic require you to be able to honestly and critically reflect you performance. To help you improve the reflection process I will introduce a model that is often used in education: the Reflection Cycle. Before the holidays, we asked everyone to vote for Nico Speelman, one of our trainers. 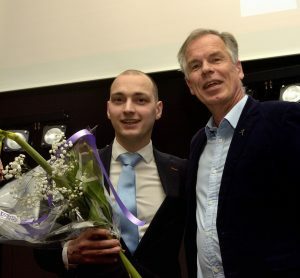 He was nominated for the title Volunteer of the Year, which would be revealed at the NSSR Sports gala. So off we went! After posing for a group picture, it was time for revealing the titles. We are very proud to announce that Nico won the title! On our Facebook page you can find a video of the moment. Nico and Rob Cuppen, who announced the winner. Photo by NSSR. Don Quichote at the Sports gala. Photo by NSSR. Besides that, as a small cherry on top, the board was told their board picture ended in the top 5. We are also very happy with that! Photo by Nils van Rooijen. The other day a was frequenting reddit.com and found a disturbing article from r/fencing on my front page ‘The sexual assault problem in fencing’. The author wrote that she is quitting the sport because sexual assault from coaches goes unaddressed. A few weeks ago, we had our beer tasting activity at the brewery De Hemel. This was quite a success, with a lot of enthusiastic members. Now, our activity committee has right away organized the next activity: Absinterkerst! This year, it will be held on December the 14th, so save the date. You’re welcome at 20:00. Would you like to join us? Write your name on the list on the notice board, or mail the committee: activities@nssv-donquichote.nl. If you’re joining, please bring 2 presents with you. These gifts may have a value of max. €5, but may also be stuff you have at home and don’t use (anymore). As an example: last year, the pineapple with a sponge was very popular. NB: Title is Absinth + Sinterklaas (Dutch tradition involving Black Piet, gifts, and chocolate letters) + Kerstmis (Christmas). December is always the month in which people look back on the past year, and then end it well with a nice party. The NSSR’s tradition is to do this with a sports gala. The gala will be held on Monday December the 10th, in Fort Lent. You can buy your ticket via the website of the NSSR. They cost €11 and include 3 drinks. During this gala, the student athletes/team/volunteer/trainer of the year will also be announced. Great news, as you can vote for one of our own club members! This year, our trainer Nico Speelman is nominated as volunteer of the year, and as a club we would like him to win this title. You can vote until December the 8th, via this link. You can only vote on the Dutch part of the website, but everyone with a student number can vote. Thanks for voting and we hope to see you all at the gala! The Keizer Karel tournament was my first ever fencing tournament. I (Nick) have been fencing since the beginning of this year, but have never competed in a tournament. When I heard about a tournament that was nearby and organised by my own club, it was a perfect time to do my first tournament. There were two poules, both of which I lost. What was quite interesting, however, was that after every match I got feedback from my opponents. Because of this, you see a lot of different playstyles and get a good amount of feedback. My first elimination was against a member of my own club and I lost that one. After I was eliminated from the tournament, I still had quite some energy left. I went around and found another fencer that was also eliminated. We fenced on an empty piste and gave a lot of feedback to each other. Because of this, you can learn a lot from a lot of different styles. This tournament really broadened my view on the possible playstyles, and I learned a lot that day. Nick (left) during the poule. Photo by Rieke Bande.